The latest news, tips, and whatever else we feel like. Today we launched the ability to embed Light Cast MediaSTREAM video in blogs. It is currently in beta, and we plan on launching more functionality to it in the near future. To learn more visit the Support Wiki here. Merry Christmas from the Light Cast Media team. May your day be wonderful and your new year be blessed! Recently Light Cast Media was selected as one of the top 20 killer sites that can inspire you by Outreach Magazine! Wow, what an honor. For us to be listed with Seth Godin, Mark Batterson, 37signals, as well as many others is off the chain. Thank you Outreach and Kevin D. Hendricks for writing the article. You can view the article and read about all 20 web sites here. Thanksgiving week has never been known as a "productive" week... However, our team was working like crazy before the Tryptophan kicked in and everyone slipped into a Thanksgiving Day food coma. Several of you have been asking about audio only streaming. We now fully support audio only streaming using two different methods. The first method requires no real work on your part. 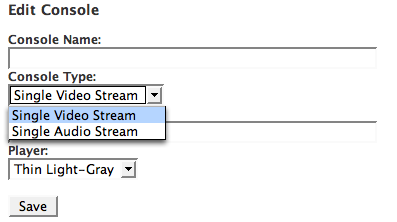 Simply create a console and set the console type to "Single Audio Stream". Select the stream by title as before. When you send someone to the new console, it will separate the audio from the video, and only send the video to them. We have also added full indexing support for flv files with no video track. Encode your audio-only track with your favorite FLV encoder and upload it. (Our favorite is MediaCoder.) The indexing system will detect your track is audio only and act appropriately. As you have come to expect with Light Cast MediaSTREAM, streamLOCK is available. You can see what part of the file someone is listening to on the live viewers screen and the server sends the stream based on timecode, saving bandwidth. From all of us here at Light Cast Media, we sincerely hope that you have a Happy Thanksgiving. On a weekly basis I get many inquiries about how NCC's (www.theaterchurch.com) streaming video looks so good. So, I asked Dave Clark from NCC to take a moment and tell us about there process. Thanks Dave for taking the time to do this! Currently, we use the Canon XL-H1 to record our weekly messages. The HD-SDI output from the camera sends an uncompressed HD signal. That is very important for our process. We will probably never actually use a tape in this camera. In my opinion, the HDV codec is subpar. The HD-SDI output from the camera is sent to a Macintosh G5 Quad with a Blackmagic Design Decklink HD Extreme capture card. We then capture the live 1080i video signal into Final Cut Pro 5 and compress using the DVCPRO HD codec. DVCPRO HD is a very nice codec. It looks great and helps keep files to a reasonable size. The Canon XL-H1 can be managed with Console, an application that allows a producer to remotely adjust all of the settings on the camera via a firewire connection. You can modify parameters like zoom, focus, iris, and color. Once the raw video is captured, we'll trim the ends to include just the message, add some fades, and then splice in any video clips that happen during the message. This process helps the production teams at our weekend services manage less during the live re-play. Once everything is just right, we export a QuickTime movie in DVCPRO HD 1080i. The final file takes about 15 to 20 minutes to render out. The resulting file size is approximately 35 to 40 gigabytes. The file is then loaded onto external hard drives that are dispatched to all "video locations” for playback. We use ProPresenter for presentation. Our ProPresenter source has been customized specifically for us to achieve 1080i playback. Once the weekend process is complete, we encode a version of the message to MPEG4 for delivery via video podcast. We also encode a Flash version for on-demand delivery at theaterchurch.com. We use Light Cast Media to stream that Flash video to congregants and site visitors. Currently, the Flash video is encoded using On2 Flix Pro with the recommended settings from Light Cast. We hope to find something on the Mac platform that will support batch encoding of DVCPRO HD files. Getting all five possible versions (HD, high, medium, low quality and audio) prepared for Light Cast in one move would be far more productive. Also, for those of you who may be interested, we are using two Panasonic AG-HVX200 cameras for all of our field work and off-site videos. I love these cameras. They record directly to hard disk (Firestore FS-100) via a firewire cable. Once a video shoot is complete, you can import your clips directly into Final Cut Pro. No more real-time capturing. It’s an excellent advantage in productivity. This week we focused on adding features to the console and squashing some newly discovered bugs. We are getting close to offering a video library system in the console management system. Stay tuned for more information on this. We also rolled out two new integration features. 1) Mark a video public and link it into your console. 2) Data-only integration. We added a workaround for a bug in some VP6 encoding solutions. This wasn't really our bug, but we do everything we can to make the service run smoothly for our customers. Video profiling. There was a bug in our profiling system causing it to not store the profiling information if the sample rate of the audio track was about 32khz. These videos would play in fail safe mode, but the initial size of the video area would be incorrect. The stream details page that you see after uploading a video is now available at any time by clicking the video name in the video manager. We will continue to add new features to this. We continue to make progress on our live video solution. It should be available to our regular customers in Q1 2007. From the developers desk this week. © 2006 Light Cast Media, LLC.